Do you love to photograph, sculpt, paint, draw, or do graphic design or animation? Or maybe fashion is your passion? Going to art school or majoring in art at a traditional college seems like a natural fit, but you may be cautious after hearing tales about starving artists. Fear not! You can make a living in a professional art career, but if you choose to do something different, you can also work in an alternative occupation that will take advantage of the knowledge and soft skills you will acquire while earning your Bachelor's of Fine Arts degree (BFA). Art critics are professional writers who compose critiques of art for newspapers, magazines, and websites. By the time you graduate with your BFA, you will have extensive knowledge about the art world. Combine that with your ability to express yourself well in writing, which is one of the soft skills art majors can develop during their time in school. Curators manage museums and related facilities. They often specialize in a particular subject matter, for example, art. Your responsibilities, if you choose this occupation, will include acquiring, storing, and exhibiting collections. In addition to your undergraduate degree, you may also have to earn a master's degree in art or museum management. Teachers educate people about various subjects. They help them learn and apply concepts. To teach, you will probably need a bachelor's degree from a teacher training program, but to enhance your qualifications, you should consider a dual major in art. It will give you much needed soft skills—problem solving, time management, and interpersonal skills, for example—that will help you succeed in the classroom. If you want to teach art, it is a must. Event planners coordinate private parties, conventions, trade shows, and business meetings. They choose venues, entertainment, caterers, and decorations. If you join the abilities you will develop as an art major, including time management, speaking, and listening skills, with your eye for aesthetics, it is easy to see why this could make a good career choice. You may want to take some classes in event management or have a dual major in hospitality management. An internship in the hospitality industry would also be helpful. Art supply sales representatives sell products on behalf of manufacturers and wholesalers. As an artist, you are more likely than other people to be familiar with those goods. 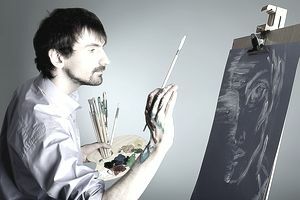 You will be able to demonstrate art supplies and give customers your opinion of their benefits. Familiarity with your fellow artists' buying habits will put you in a good position to convince retailers of products' appeal to their customers. This makes you more qualified to sell art supplies than most other people are. In addition, the interpersonal and communication skills you gain in school will serve you well. Fine art salespeople sell photographs, paintings, sculptures, drawings, and other works of art to the general public and collectors. They work in galleries and other retail businesses. Your education will you an understanding of art that most other people do not have. While in school, you will also learn how to describe your own work and that of other artists. Art therapists are mental health professionals who use art and the creative process to help their clients deal with mental health issues. This occupation combines knowledge of visual art with the study of human development, therapeutic practice, and psychology. Your BFA will take you at least partway there. A master's degree in art therapy will also be required. Applicants to graduate programs need prerequisite coursework in psychology and human development. Admissions counselors at postsecondary art schools promote their institutions to potential students and their parents, as well as to high school guidance counselors. They meet with prospective students both on and off campus. Counselors deliver presentations, answering questions, and give tours. They also interview candidates, review applications, and participate in admissions decisions. Your experience as an art student and an artist will uniquely qualify you for this job. The communication and presentation skills you acquired while earning your degree will also prepare you well.